Located 55 km away from Thiruvananthapuram on the highway to Nagarcoil-Kanyakumari, Padmanabhapuram was once the seat of the rulers of old Travancore or Venad State from the16th to the late 18th centuries. The name refers to the image of the lotus coming from the navel of Vishnu (Padma - lotus, nabha - navel, Puram - Town). The palace complex was constructed around 1601 A.D by Iravi Varma Kulasekhara Perumal who ruled Travancore between 1592 A.D. and 1609 A.D. (767 M.E and 784 M.E). The construction of the Perumal palace at the centre of the complex was completed in 1744 A.D. On the day of its completion, Maharaja Anizham Tirunal Marthanda Varma, dedicated this palace to Lord Padmanabha and named the palace Sri Padmanabha Perumal Palace. 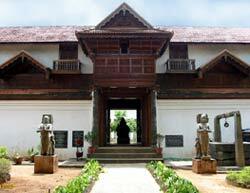 From then on the fort and the surroundings earlier known as Kalkulam came to be known as Padmanabhapuram. 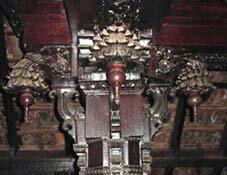 Padmanabhapuram palace cover an area of around 7 acres. The complex consists of individual structures linked by a maze of corridors, colonnades, verandahs, courts and constructed of teakwood and granite and stands within the massive stone walls of 30 ft which kept Tipu Sultan at bay in the 18th century. Exquisite wall paintings, fascinating traditional Kerala architecture, floors finished to a high polish with a special compound of crushed shells, coconuts, egg-white and juices of local plants; sunny courtyards with carvings and sculptures are some of the outstanding features of this sprawling palace housed within fortified walls. The palace has its main entrance from the west. The 'padipura' or the main gate reached after crossing a large courtyard, displays an ornamented gabled roof. The 'Pumukham', inside the second court, has a profusely carved rosewood and mahogany ceiling with 90 different inverted flowers, a polished granite bed in one corner and an ornate Chinese throne. There is an audience hall on the upper level of the two storeyed building with circular wooden columns and angled timber screens to let in light and air. The third court marks the beginning of the private zone of the palace. Here, on the north of 'Pilamottu Kottaram' is 'Upparikka Malika' (upper storey) or the Perumal Kottaram. Its four chambers, arranged one above the another, connected by steep steps, served as a treasury on the ground floor, the royal sleeping chamber on the second floor, the royal meditation chamber and shrine room on the fourth floor. On days of penance, His Highness took rest on the third floor, which also served as his prayer room. The 18th century Kerala murals on the walls remains unblemished even after centuries and surpass even those at Mattancherry palace in Kochi. There is also a four poster medicinal bed of 64 ayurvedic healing woods here, many presented by the Dutch. Each room in the palace has its own characteristic style. A guided tour through the maze of 108 rooms leaves one breathless at the artistic expression and sheer opulence of these magnificent rooms. Painted mahogany musical ceremonial bows adorn a wall, a huge brass oil lamp hangs from an ornate teak, wooden ceilings profusely carved etc are a feast to the eyes. The manthrasala (Council chamber) with a shiny hard black floor specially made from a combination of egg white, jaggery lime, burnt coconut, charcoal and river sand, granite tubs to cool curd and buttermilk and some coloured mica in the windows, is situated right at the top of the portico of Pilamoottu Kottaram (palace). The 'mattuppavu' (balcony) situated on the south served as the dining hall of the palace employees. An enormous 2 storeyed hall served as an 'oottupura' ( dining hall), where 2,000 Brahmins were fed free once daily. The paintings in the prayer room are simply superb. However this room is mostly kept locked and one has to have permission to enter. The fourth court of the palace occupies the east part of the complex. Some of the other interesting sections and items in this palace are royal chairs with Chinese carvings, secret underground passages which is said to run from another palace 2km away, Belgian mirrors in the ladies chambers and pictures of Lord Krishna, hanging brass lanterns lit continuously since the 18th century, hanging cage through which eagles tore criminals to death, open air swimming bath, the King's sister's dressing room with two hanging beds. 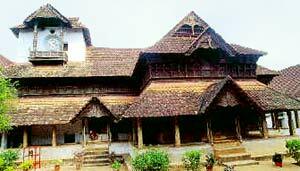 One of the oldest buildings in the complex is 'Thaikkottaram' or the Queen Mother's palace (1550) with intricately carved wooden pillars, painted ceilings and a red polished floor, then there is the Alambara Bhagavati temple and Saraswathi temple, large earthen urns, room for scribes and accountants, carved figures on columns holding oil lamps, pooja (worship) rooms with jackfruit tree columns, fish carvings on the ceilings, 'Lakshmivilasam', granite dance hall known as 'Navarathrimandapam', 'Chandravilasam' which served as the summer resort of the royalty to the north west, 'Indravilasam' incorporating a residence and audience hall, partly built in a Neo- Classical style building, Thekke Kottaram (southern palace) and 'Neerazhi Kettu' (bathing ghats) on the south, 'Ekandamandapam' or 'the lonely place', the 'Homappura', where religious offerings were made, enormous teak beams and an outer cyclopean stone wall fitted together without mortar. The palace archeological museum located in the first courtyard from the entrance, houses artifacts including furniture, Travancore coins, wooden and granite sculptures, stone and copper plate inscriptions, ancient armaments such as swords, rifles, spears and shields. Though the palace is now in the State of Tamil Nadu, it was once the traditional home of the royal family of Travancore, so it is maintained by Kerala Archaeology Department.